Other Appearances: Godzilla: Tokyo S.O.S. The year 1999 saw the arrival of a monster similar to the creature that attacked Tokyo in 1954. 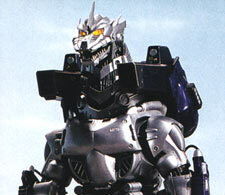 In response to this new Godzilla's sudden appearance, the Japanese government commissioned the creation of a robotic clone of the monster in order to counter its ever-growing threat. The bones of the original Godzilla were salvaged, the spinal cells underwent controlled mitosis, and a massive machine machine was built around the skeletal frame in order to create a mechanical Godzilla, nicknamed "Kiryu". Three years of hard work saw the finished product of human inginuity. With Type 90 Maser Cannons, twin lasers, an electrically-charged blade, rocket boosters, shoulder-mounted missile launchers, and the demolecularizing energy weapon known as the Absolute Zero Cannon, the most technologically advanced machinery was brought together in one place for the sole purpose of Godzilla's destruction! As Kiryu was revealed to the world in 2003, Godzilla attacked. Kiryu was sent into battle, but its initial weaponry was of little effect. Unfortunately, before Kiryu could fight much further, it suddenly went beserk as Godzilla roared into the sky. Kiryu recovered a memory of the 1954 Godzilla deep in its spinal cells. The mechanical monster ran amok through the city as Godzilla returned to the sea. Eventually, Kiryu's power supply ran out. Kiryu was put out of commission, until Godzilla once again attacked. The prime minister of Japan realized how dire the situation was, and he sent Kiryu into battle. Missiles and lasers were fired. The two creatures clashed, slowly knocking into each other. Missiles, masers, the wrist blade, and all of Kiryu's lesser weapons were used to contend with Godzilla at a close range. Kiryu sent Godzilla into a centrifugal throw as it began to charge its ultimate weapon: the Absolute Zero Cannon. Unfortunately, Kiryu was downed before it could be used. Its pilot, Akane Yashiro, managed to take manual control of the robot as the machine was recharged. Kiryu was sent back into battle, disabling Godzilla's heat ray and firing its Absolute Zero Cannon! Godzilla managed to survive, but Kiryu's power supply was exhausted. Godzilla returned to the sea, as Japan could only watch on in a bittersweet stalemate. Unfortunately, the final checks weren't completed when the hour of Godzilla's arrival had come. The monster was being drawn to the bones of the original Godzilla, which were used as both the skeletal and organic guide for the creation of the massive machine. Despite the grave danger, Prime Minister Hayato Igarashi didn't release Kiryu just yet, for Mothra had arrived to battle the gray gargantuan first. As the war progressed, however, she began to lose her dominance in battle, and the Prime Minister realized that Mothra required urgent assistance. Kiryu was airlifted to the battlefield, where the heroic automaton saved Mothra from certain death just in time. Kiryu launched a barrage of missiles and emitted its hyper maser at its reptilian rival, when Godzilla prepared to produce his thermonuclear ray. As Kiryu dodged the onslaught by taking cover behind a building, it again launched its missiles. They converged on Godzilla, and the combined explosion forced him to lose his balance and fall backward into a building. In retaliation, the saurian savage's thermonuclear ray burst through the building that Kiryu was using as shelter. Eying the immobile mech, Godzilla prepared to fire his breath once more, but Mothra intervened and took the brunt of the assault. Kiryu regained its balance and fired its shoulder-mounted rocket launchers at its feral foe. Though the mighty monster laid waste to the first incoming rocket, the second torpedo lodged into his chest and burst into flames. Godzilla's pectoral wound, forged one year earlier, was now rendered even more vulnerable. Kiryu proceeded to trip Godzilla with its tail and toss him over its head, but the angered animal managed to return the favor by knocking his bionic brother off of his feet and scorching the robot with his atomic breath. Kiryu was down for the count, and it was in desperate need of repair! While Kiryu was out of commission, Mothra's offspring appeared in the combat zone, prepared to take the slack off of their ailing mother. Unfortunately, Godzilla soon annihilated Mothra, and the twin caterpillars were left alone to fight the vicious behemoth. As the two tiny monsters continued to wage war against their oppressor, the mechanic Yoshito Chujo managed to repair Kiryu, at the dire cost of his ability to escape. Kiryu reentered the melee and began to grapple with Godzilla. As the intensity of their brawl continued to escalate, the mechanical giant and its organic counterpart plummeted into the Diet Building. When they rose once more, Kiryu's hand transformed into a drill, and it sliced into Godzilla's chest wound. Kiryu proceeded to corrode the wound further through the use of its maser cannons, and Godzilla began to look very ill; he had lost the will to fight! The Mothra larvae wrapped Godzilla in a soft and silky cocoon, and the once invulnerable tyrant finally fell to the city streets, roaring in agony. 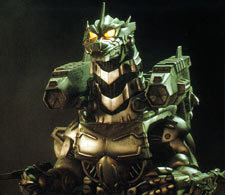 Godzilla's pitiful roars disturbed Kiryu's bones, which harbored a strong spiritual connection with the original Godzilla's soul. The saurian cyborg went berserk and began to restrain its former foe. It rocketed into the sky and over the sea, for all control over the bionic beast was lost. As Kiryu continued its journey, it oddly seemed to assist Yoshito Chujo in his attempt to escape. The living machine even bid his mechanic one final farewell by displaying the following message on one of its display terminals: "Sayonara Yoshito". Yoshito escaped, and Kiryu sank deep into the endless expanse of the ocean depths. It tightly grasped Godzilla as it disappeared into the indigo abyss of the Japan Trench. The souls of the dead were finally put to rest.